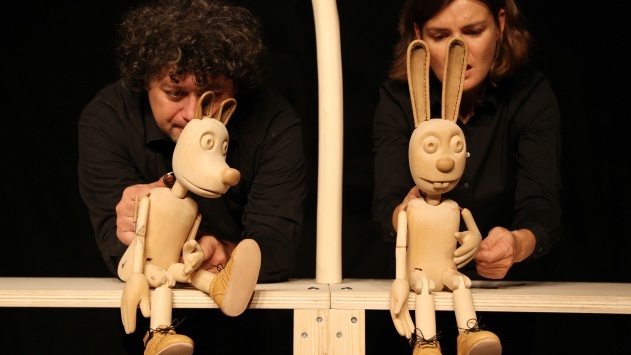 A comedy with running and singing designed for the youngest audience and directed by a versatile puppet artist Silvan Omerzu, features an artistically purified, musically inspiring, playful and dynamic work. A simple, modular stage assembly, with wooden puppets and props, unfolds before the viewers an exciting and - until the performance’s very ending - interesting competition between the two neighbours, who eventually become friends. Its witty text was contributed by the writer of the younger generation Saša Eržen, whose picture book »The One about the Fleas« ranked her among the five finalists for the Original Slovenian Picture Book Award.